We have made this pancake design to accommodate large PMR 30 magazine and firearm. These have become very popular for people that want to carry a .22 auto in the field. 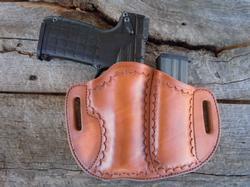 If you have a gun which is not in our drop down list, contact us to find out if the holster will be practical, before you place an order. 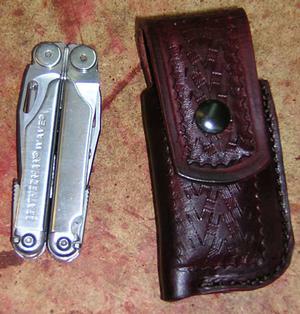 Some folks carry these IWB apendix carry fopr smaller autos or Weakand IWB for a spare gun and magazine. 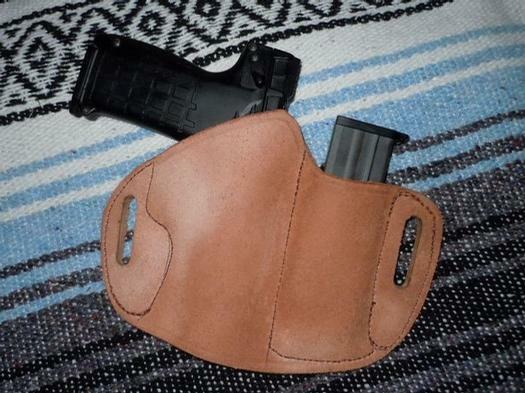 For self defense order a Cuda or Cumberland with a separate opposite side magazine pouch; extra magazines are best carried on the opposite side of the body and employed by the weak hand, while the dominant hand maintains a firing grip on the firearm. Note: Floral or Celtic knot carving do not work well with black; oxblood or tan work better. Fishscale, or border stamping is not available option for Celtic knot work.